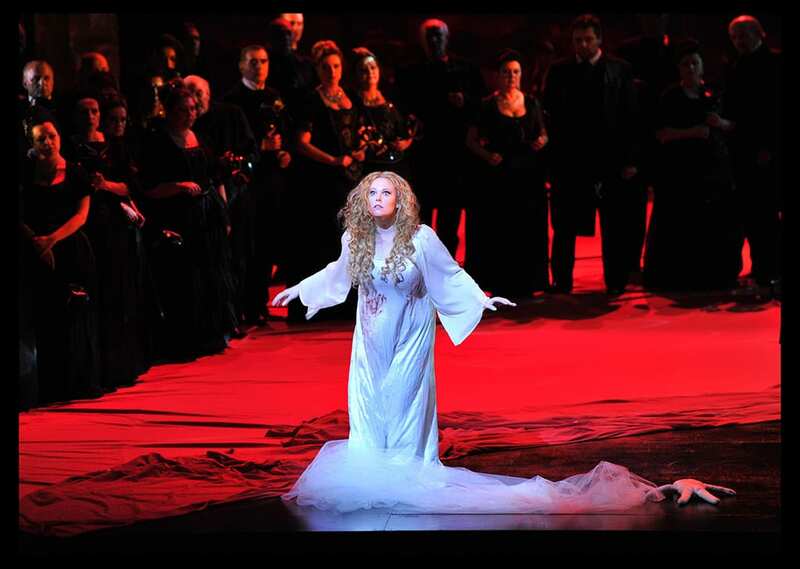 One name – Maria Jose Moreno – makes almost the full story of this production of Lucia, originally created for the Oviedo Opera House and first performed by The Israeli Opera five years ago. In her Israeli Opera debut, the Spanish-born soprano was a perfect fit to the role of Lucia, a statement that cannot be made easily with such a popular and demanding role. Her voice and her stage presence were of the highest quality. In Donizetti’s eternal Mad Scene I was totally convinced that the woman totally lost her mind, with very delicate both voice and gesture nuances. My vivid memory of Dame Joan Sutherland in her iconic role thirty-something years ago at the Met was not haunting me for one second. Bravo! Moving sharply to the other extreme, a very annoying element of this production was, believe it or not – the lighting! Throughout most of Act I viewers sitting like me at the right-hand side of the hall were completely blinded by the metal-like wall on the left-hand side of the stage, reflecting the aggressive lights from the other side of the stage. When they finally went off, the back of the stage became one wall of bright light. In both situations it was very difficult to follow whatever was going on stage. I have no idea if this was poor implementation of Eduardo Bravo’s design or his original intention. In any event, it took away much of the pleasure. Generally speaking, the design of the set was too dull and unimaginative to my taste, with the exception of the wedding scene. Back to the music, another notable performance was of tenor Alexei Dolgov in the role of Edgardo, Lucia’s lover. He enjoys beautiful and powerful voice, high dramatic skills and was a suitable partner to Maria Jose Moreno’s shining performance. Also notable, though is less central roles, were bass Dario Russo as the Calvinist Chaplain Raimondo, tenor Guy Mannheim as Normanno and mezzo soprano Anat Czarny as Alisa. Less convincing was baritone Mario Cassi as Enrico, Lucia’s brother. The amazing music of Donizetti was very well served by conductor Daniele Callegari and his orchestra. Callegari is not a new face at the Israeli Opera and time and again he demonstrates his perfect command of the partitura. Kudos to chief flautist Adi Menczel, for her moving solo in the Mad Scene, as well as to the Israeli Opera Corus.